It’s called OmniSkins, and it’s the brainchild of assistant professor Rebecca Kramer-Bottiglio and her colleagues at Yale University. The neat thing about OmniSkins is its extreme versatility—it’s a general-purpose system with no specific task in mind. It enables otherwise inanimate objects to move, or provides an extra boost to robots or animals in need. 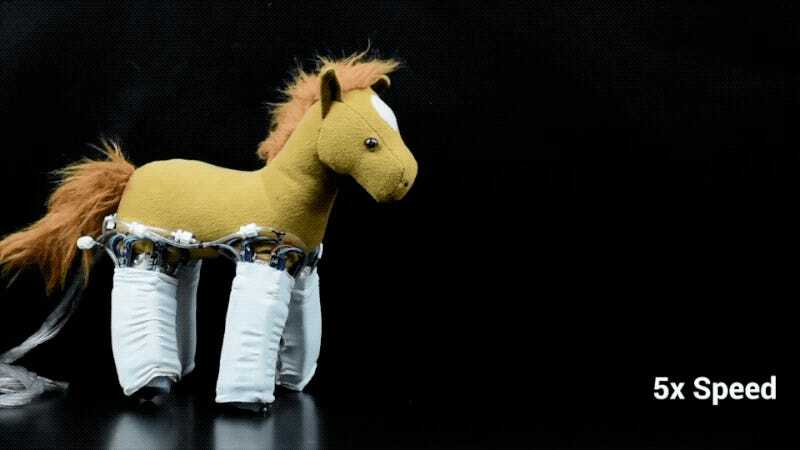 Eventually, the electric skin could be used to create more effective search-and-rescue robots, enable locomotion in everyday objects, and improve wearable or assistive devices. A report on the OmniSkins project, which was primarily funded by a NASA research grant, was published today in Science Robotics. Kramer-Bottiglio came up with the idea a few years ago when NASA asked developers to make better and more versatile soft robotic systems. For NASA, the need for this kind of tech is obvious. Astronauts could use OmniSkins, or something like it, to adapt and reuse tools onboard the International Space Station. A robotic arm, for example, could be made from a piece of foam. More conceptually, the system could be used to create a soft, ball-shaped Mars rover capable of rolling and bouncing over the Red Planet’s difficult terrain. A stuffed animal “roboticized” by the placement of OmniSkins. The robotic skin not only initiates movement, it can also sense the “pushback” from an object to help the system know how much force is needed to generate movement. The motion achieved by an object “depends on the relationship between the dimensions, material properties, and force capabilities of the skin and the dimensions and stiffness characteristics of the body,” the authors write in the study. The robots can be controlled remotely by an operator or by using built-in light sensors. As noted, the strength of this tech lies in its versatility, as most robotic systems are typically single purpose in scope. With these robotic skins, however, one could potentially create all sorts of different robots, and even alter their functions on the fly. Multiple skins could be applied to the same object, expanding functionality even further by allowing for more complex movements. The system is lightweight, easily transported, and can be used on a wide variety of materials. In fact, the researchers say OmniSkins could even be used on crumpled balls of paper and balloons.